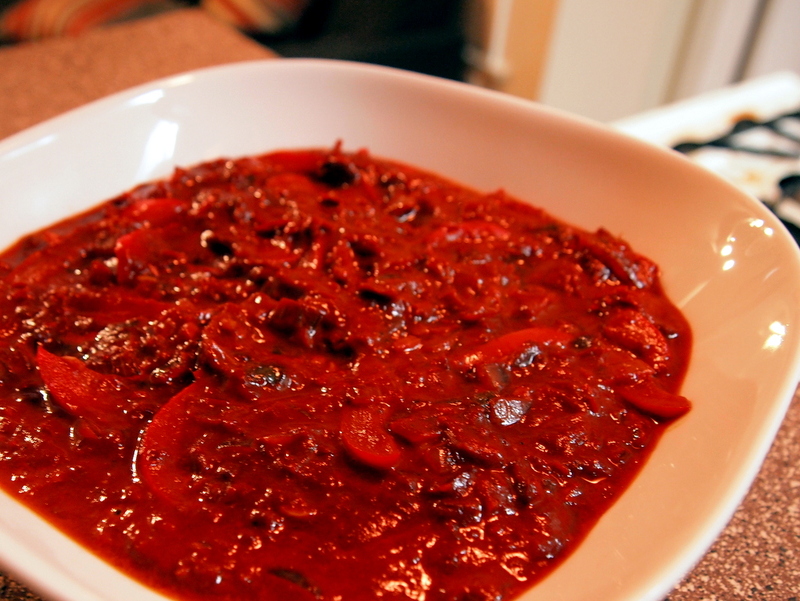 This red sauce is made mainly from dried Mexican guajillo chili peppers, which have an amazingly rich flavor, especially when fried a little. Also, this sauce isn’t just for enchiladas – it also goes great as a dipping sauce for tortilla chips or as a table condiment for your next Mexican meal. Boil dried guajillo and chipotle peppers in a pot of water until softened, about 10 minutes. Drain the water and, when the peppers are cool enough to handle, remove the steams. Tip: If you are making broth from Better-than-Bouillon or a cube, reserve some of the pepper water for the broth! Heat 2 tablespoons of oil in a large skillet. Fry the softened peppers for a minute on each side on high heat until fragrant. Remove from heat. Leave the leftover oil in the skillet and remove the skillet from heat. Transfer peppers to a blender. Add the broth and puree until smooth. Reheat oil in the skillet and saute bell pepper, onion, garlic, tomatoes, and oregano until the peppers are soft, about 10 minutes. Add the pepper puree and continue cooking for another minute or two. Season with salt to taste and serve! Note: If desired, you can blend the sauce again for a completely smooth sauce, but I like it with the strips of pepper and diced onions.